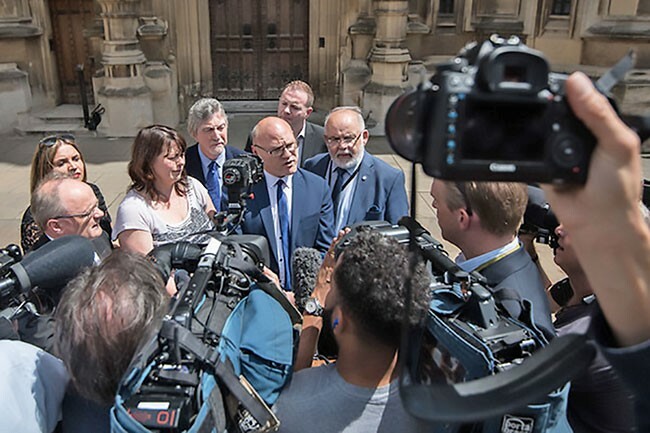 THE seven-strong Sinn Féin MP team hit the ground running after landing in London on Tuesday 13 June – just five days after a watershed Westminster election. The newly-elected team of MPs were there for a two-day programme of engagement with political parties, civic leaders, and members of the Irish Diaspora. Reflecting Sinn Féin’s commitment to an all-Ireland approach, the MPs were accompanied by party colleague Pearse Doherty TD. The team met with representatives from all the major political parties in Westminster to express concerns around any potential deal to be struck between the Tories and the DUP. “This new arrangement is very unsettling and people are concerned and wary of what it may mean and what promises will be given or promises extracted from British Prime Minister Theresa May. As part of their visit, the MPs met with James Brokenshire, the British Secretary of State. Brokenshire was told in no uncertain terms that his government had failed to meet its obligation as a co-guarantor of the Good Friday Agreement. He was warned that Sinn Féin would not tolerate any backroom deals with the DUP that might undermine past agreements. He was also challenged on the ideologically-driven cuts and austerity inflicted on the North of Ireland by successive Conservative governments. The following day, the MPs met with the General Secretary of the Trades Union Congress, Frances O’Grady, to discuss the impact of Brexit on Ireland. The MPs outlined how the possible re-emergence of physical checkpoints along the Border corridor would have a dire effect on workers. They also discussed the risk of a ‘capital flight’ from the Six Counties to the 26 Counties and the disruptive effect this would have on communities in the North. The visit received considerable media coverage and attention. At a press conference hosted by the Foreign Press Association, British media outlets were out in force demonstrating their sudden interest in Irish politics. The press conference was also attended by correspondents from around the world including Germany’s Die Zeit, France’s Le Monde, Italy’s La Repubblica, Spain’s El Mundo, Canada’s The Globe & Mail, China’s Xinhua News Agency and Japan’s Kyodo News (amongst others). The Sinn Féin MPs carried out extensive interviews with reporters from a range of media platforms, including RTÉ, BBC, UTV, Sky, Channel 4, TalkRadio, Russia Today, BuzzFeed, the Daily Mirror, Morning Star, and the New Statesman. Across all of these interviews there was a marked interest in the Tory Prime Minister’s new DUP bedfellows. As Barry McElduff MP reflected, now that the media spotlight is firmly on the DUP, “maybe the people in England, Scotland, and Wales will begin to learn about the true nature of the DUP – their homophobia, their sexism, their sectarianism, and their anti-Irish regressive politics”. 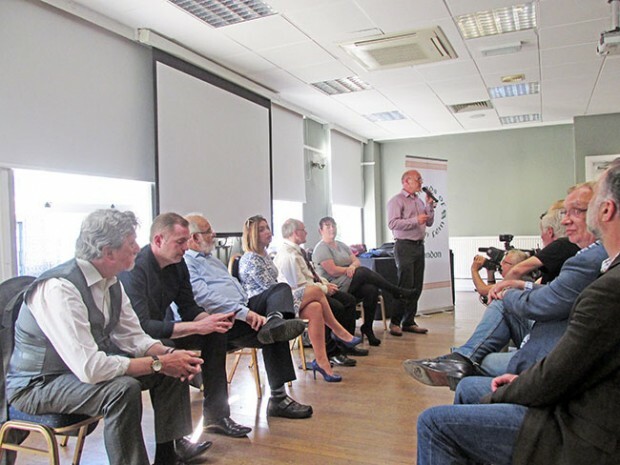 With just two days’ notice, more than a hundred people came out to meet the seven new MPs for a series of engaging Q&As at a public meeting in the London Irish Centre in Camden. The high turnout and the level of enthusiasm in the room demonstrated that Sinn Féin’s election victory resonated with the diaspora community in Britain. At the conclusion of the meeting, Paul Maskey MP pledged that the MP team would be seeking further engagement and greater interaction with the Irish community in Britain and appealed for their assistance in doing this. The following day, six of the MPs left for the Oireachtas in Dublin to attend the the Joint Committee on the Implementation of the Good Friday Agreement in Leinster House, joining colleagues from across the 32 Counties. Elisha McCallion MP remained behind in London to be joined by Gerry Adams TD, Mary Lou McDonald TD and Michelle O’Neill MLA as they met British Prime Minister Theresa May in 10 Downing Street. This visit occurred during a very difficult week for London following the Grenfell Tower fire. The Sinn Féin MPs and the Sinn Féin London Office extended their condolences to the victims of the disaster and commended the first responders for their heroism.